Elkhart Lake, Wisc. 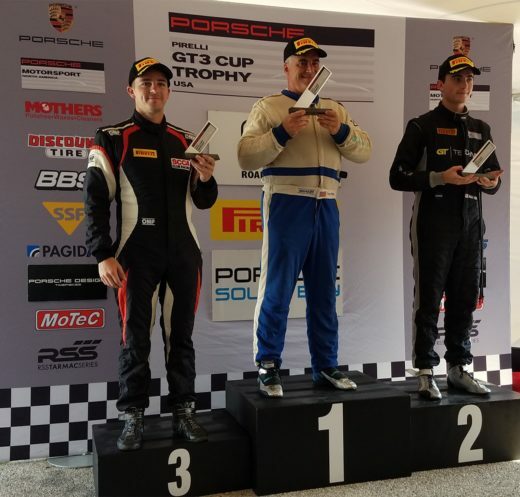 – In an unseasonably warm Autumn afternoon at Road America, 911 Design’s Loren Beggs charged up from a seventh-place starting position to take the overall victory and maintain his championship lead in Race 13 of the Pirelli GT3 Cup Trophy USA on Saturday. 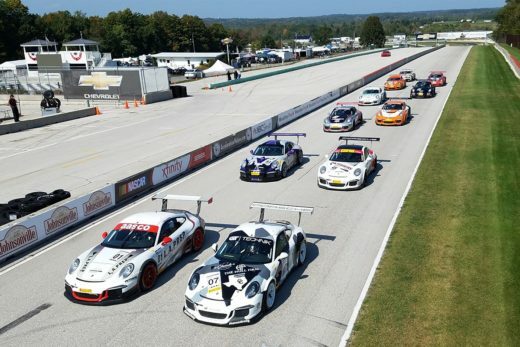 With temperatures hovering above the 90-degree mark, drivers worked hard to manage conditions that only added to the difficulty level at the iconic 4.048-mile road course. Beggs, behind the wheel of the No. 08 Porsche 991 GT3 Cup Car, began working his way through the field as the leaders battled. 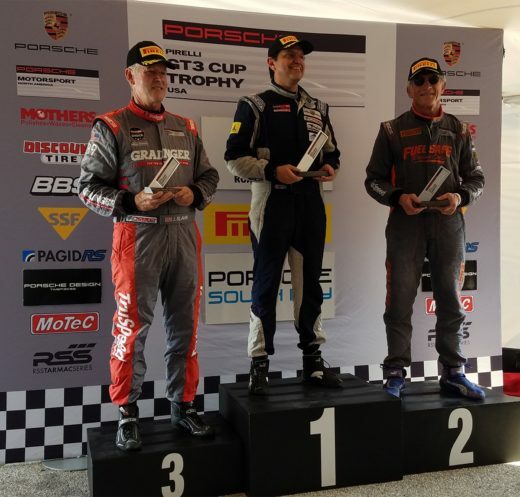 The overall and Diamond Class (for Porsche 911 997.1 versions) lead changed hands three times over the race’s 18 caution-free laps, with pole sitter Alex Kirby and college freshman Max Root running side-by-side at the drop of the green flag. Root battled back to the front after falling to fourth and took advantage of a spin by Kirby to take the lead. But Beggs would not be denied, ready to grab the top spot when Root ran just wide enough on Lap 14 to allow the wily veteran through for his fifth win of the season. Diamond Masters saw another spirited battle, as the entire class ran in close quarters for much of the race. Michael Zuieback (No. 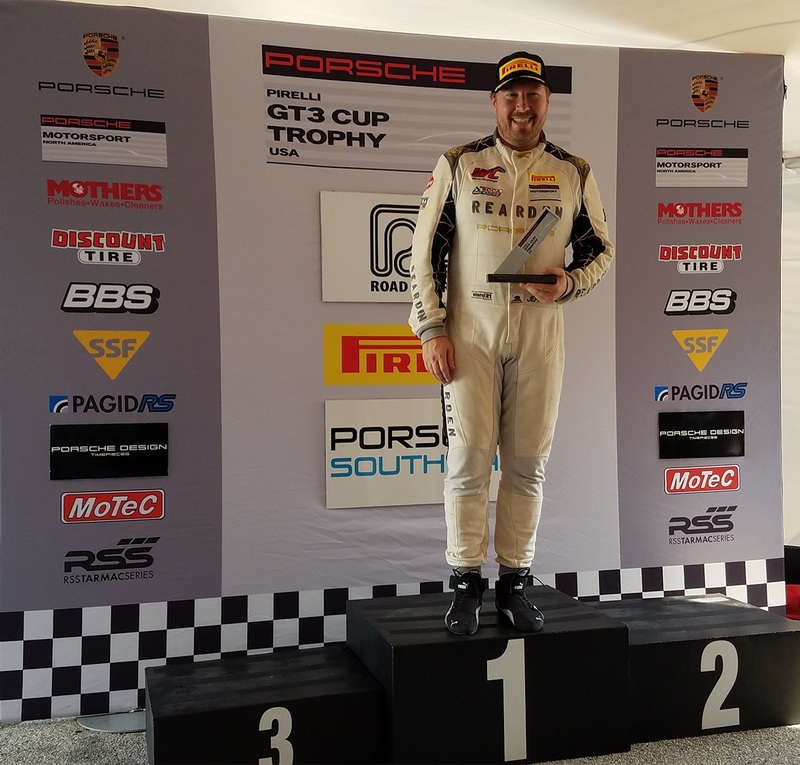 2 Discount Tire / Competition Motorsports) pressured pole sitter Dave Elsner (No. 93 911 Design) late in the race and was in position to take advantage when Elsner went off in Turn 8 on the penultimate lap, putting Zuieback and his No. 2 Porsche in the top spot for the third time this season. 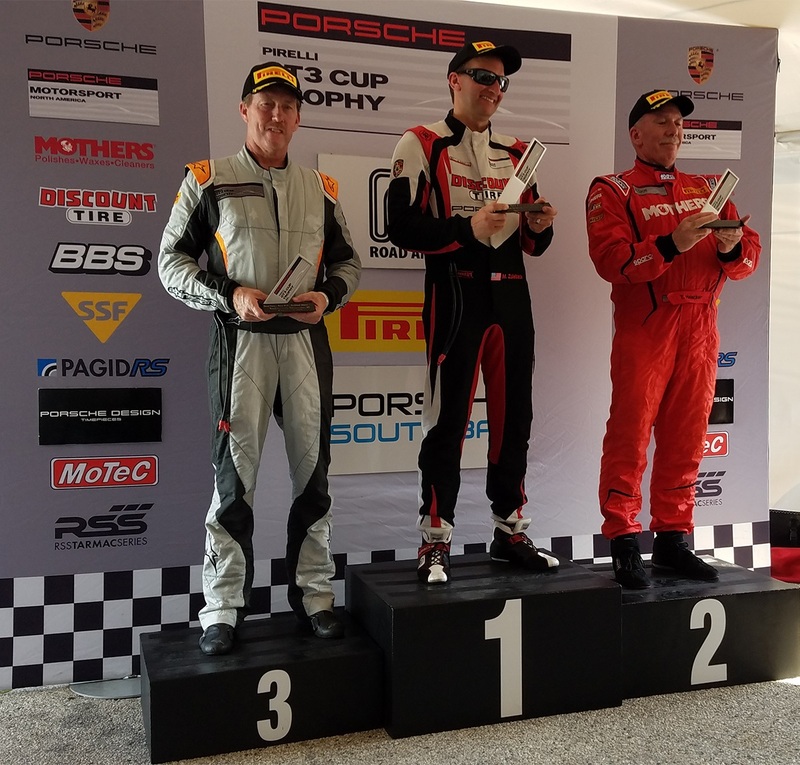 In the Platinum Class (for Porsche 911 997.2 versions), competitors saw the opportunity to make gains in the title chase with championship leader Ray Shahi absent this weekend. Robert Gardner (No. 33 Basin Fluids PCS Motorsports) took the green flag at the front of the class, but Larry Schnur (No. 32 TruSpeed Autosport), recovering from his own Friday incident which prompted a move to another car, made a pass for the lead in Turn 4 early in the race. Gardner pressured Schnur into an uncharacteristic mistake and roared through for his first series victory. 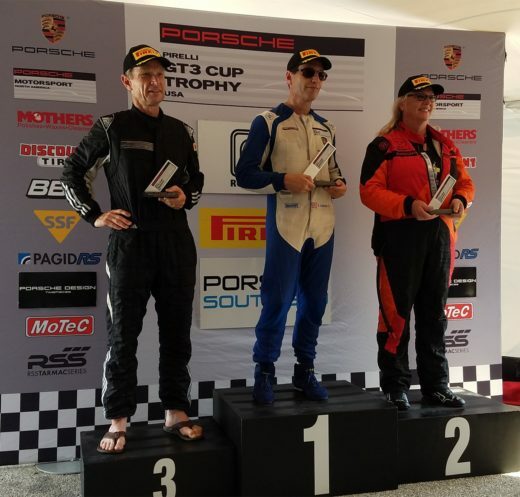 In Silver class competition for Porsche Cayman GT4 Cup Cars, championship leader Jeff Kearl (No. 26 Rearden Racing) and second place Sean McAlister (No. 00 Competition Motorsports) each incurred damage in separate Friday practice incidents that could not be repaired in time for the weekend’s racing. Kearl jumped into his backup car and took the uncontested class victory while making sure not to impact the race battles around him. Silver Masters saw title leader Steve Goldman put his No. 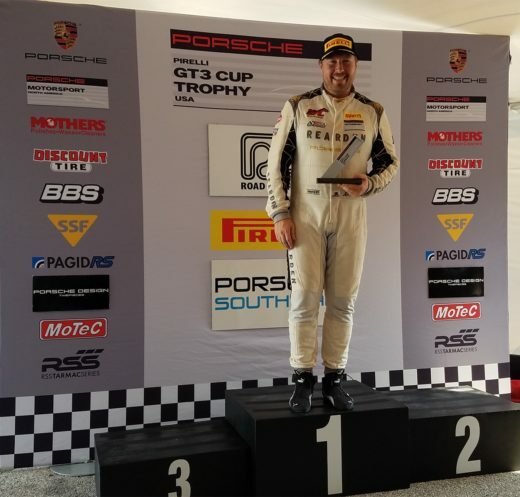 1 Competition Motorsports GT4 on pole and take his 10th race victory of the season, albeit with plenty of pressure from teammate Laura Ely (No. 9 Competition Motorsports), who finished second. The Pirelli GT3 Cup Trophy USA will return to Road America for Race 14 on Sunday with the green flag set to fly at 1:15 p.m. CDT. This entry was posted in News on September 23, 2017 by admin.